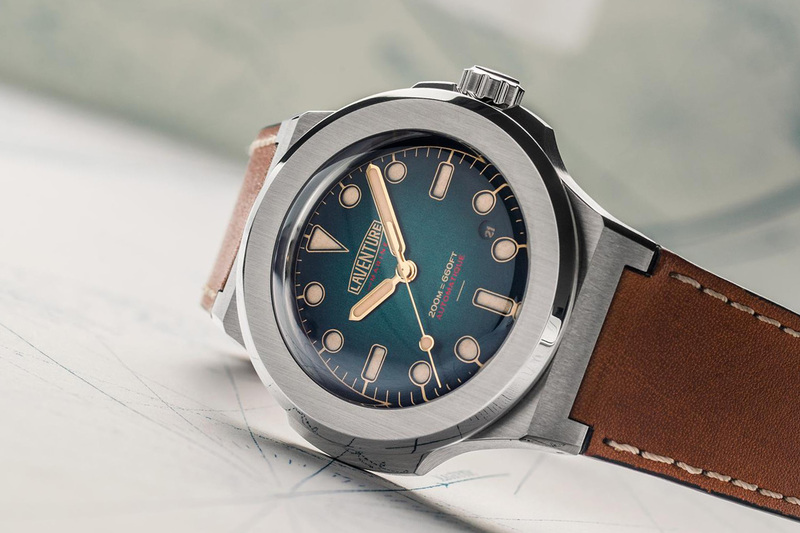 LAVENTURE has created a project to produce a series of timepieces for explorers and adventurers. 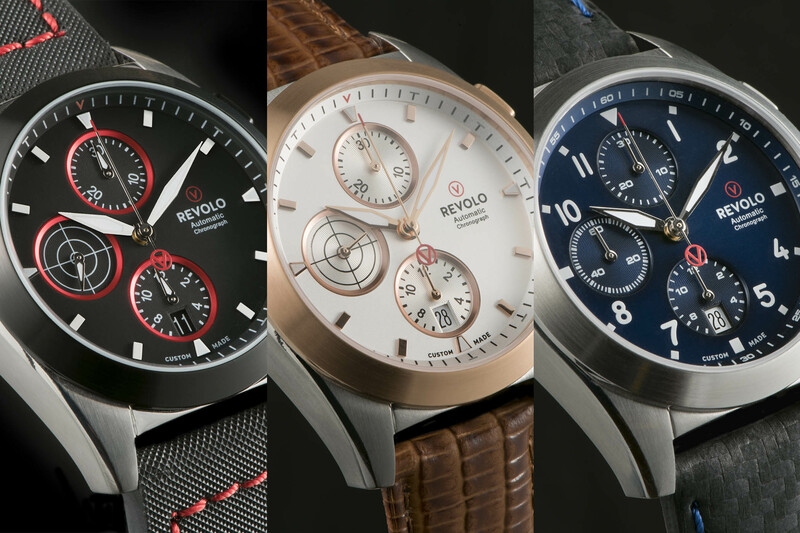 The watches will be Swiss made and will be 90% made in Switzerland – beating the 60% requirement to be considered “Swiss”. 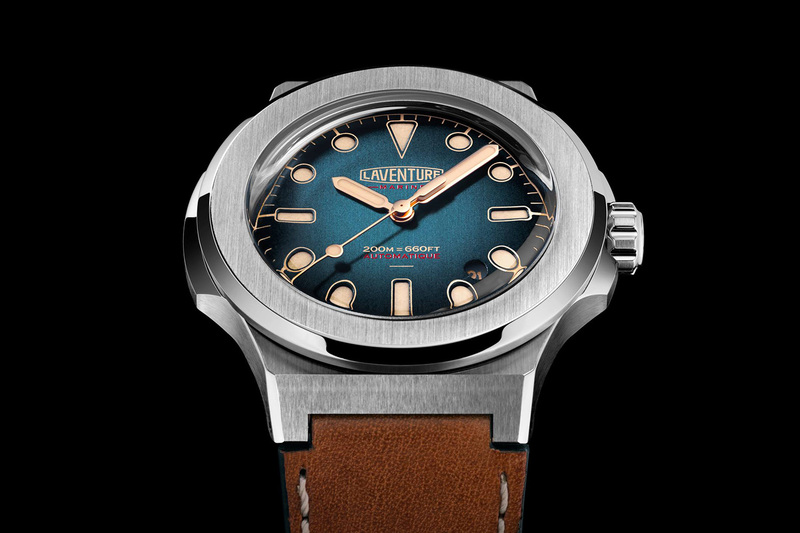 LAVENTURE represents a word for exploring and journeys and the first creation is called LAVENTURE Marine, which has been inspired by the 1960’s diving watches. 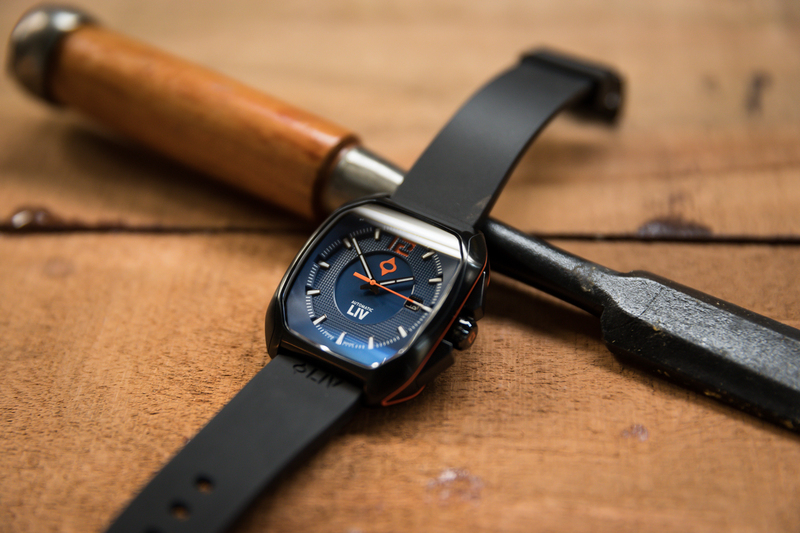 Just 18km separates where the watch series has been designed and manufactured, making it a real Swiss made watch. 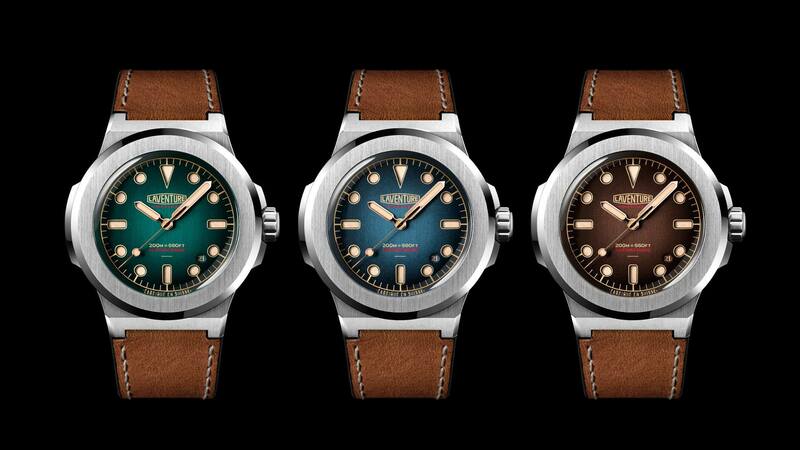 This LAVENTURE Marine watch is available in three different colours: Marine Blue, Marine Green and Marine Brown. This excellent timepiece’s stainless-steel case is 41mm in diameter and 9.80 in thickness, which makes it the perfect fit for most wrists – not too large, yet modern, not too thick, thus pleasant as a daily beater. The crown has been screwed on as well as the joints being oversized, which makes the watch water resistant for up to 200m (660ft), which reinforces the adventure meaning behind the brand. However, even with such water resistance, don’t call it a dive watch, as no diving bezel has been fitted. It is a sports watch, rugged enough to withstand most situation, including an occasional jump in cold waters, alongside other adventures. 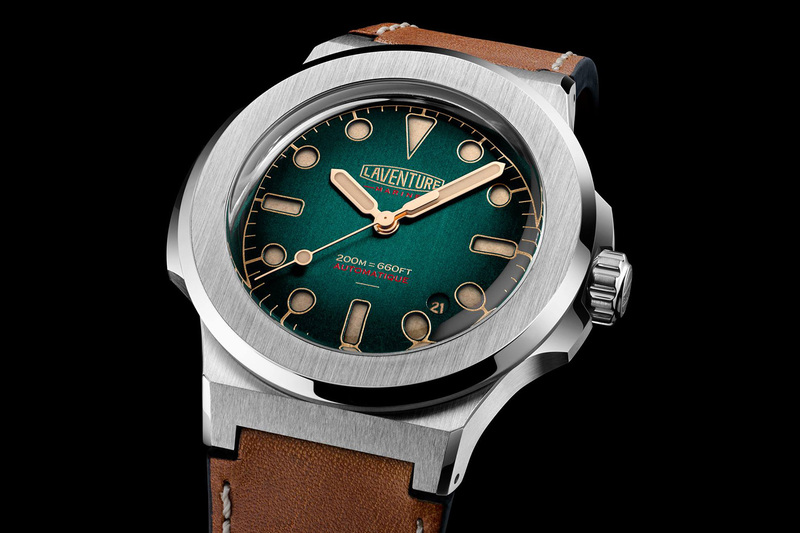 One aspect that might be the reason of the LAVENTURE Marine Watch might be in the shape of the its case. 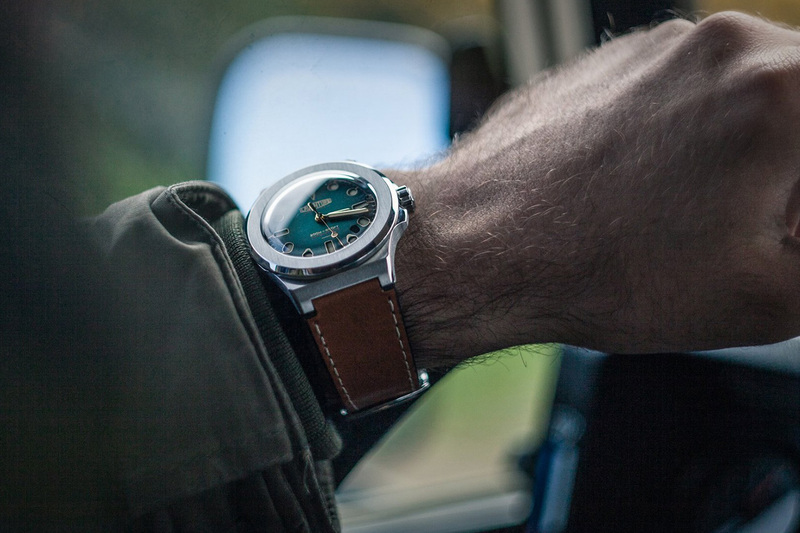 Indeed, the watch resembles the 1970’s Nautilus watch, especially the “ears” that stick out on both sides of the stainless-steel casing and the alternation of polished bevels and vertically brushed flat surfaces – so to say, not the worst reference. However, in terms of dial, the story is different. 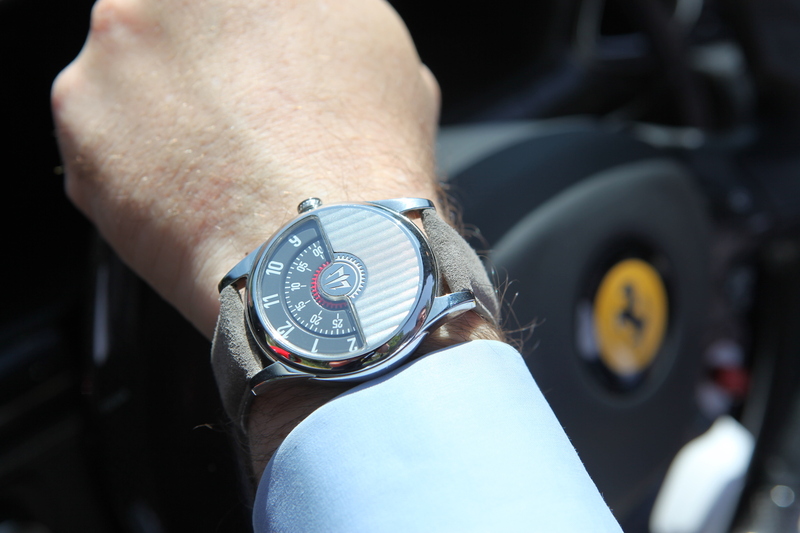 The dial has been designed in “sandwich” construction, which offers a very sleek design. The markings and needles are both in metallic colors, which offers a great contrast for an added vintage look. The hands of the LAVENTURE Marine watch are gold “gilt” with Super-LumiNova beige vintage paint. Everything in this watch recalls the great days of exploration and this dial is no exception. The watch has been made up of two superimposed plates. The satin upper part comes with a shade of either blue, green or brown with darkening on the edges. The beige photo-luminescent covers the bottom plate which offers fantastic reading during the day and night, thanks to the contrast between light and dark. You will not only have a choice of three dial colours but you will also get to pick out of four bracelet colors for the two bracelets you receive. You will have the choice between light brown, dark brown, dark green and dark blue veal leather bracelets with vegetable tannage and a ardillon buckle. You will be able to choose your two bracelets once the campaign is over. The movement of this Swiss watch is a Swiss automatic movement ETA 2824-2. 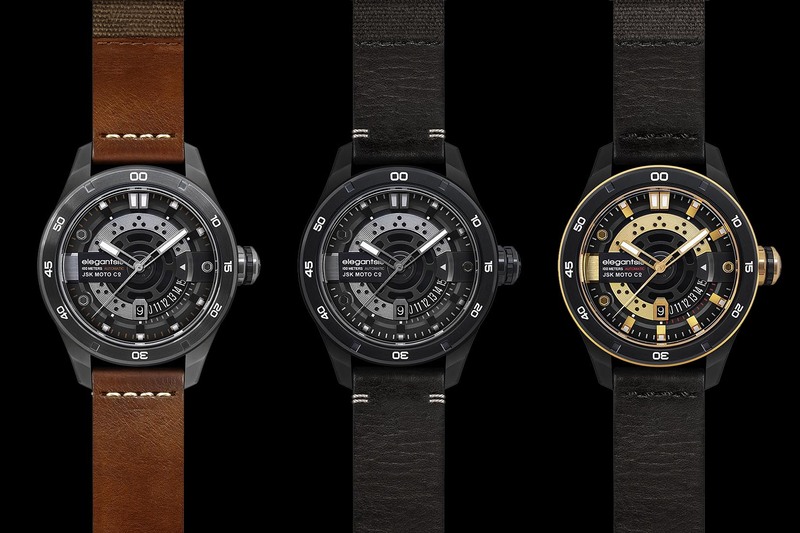 ETA is a leading Swiss watchmaker which makes it a very reliable calibre for the price. This movement is a workhorse, with 25 jewels and 42h power reserve when fully wound. 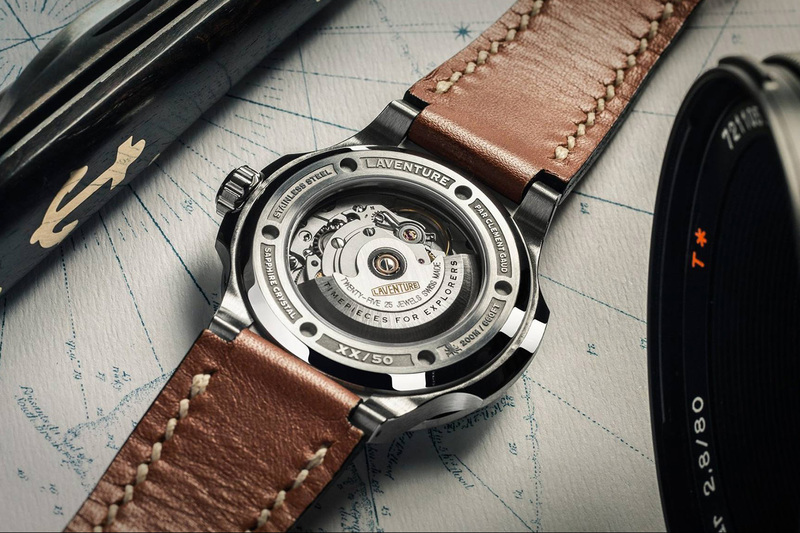 The movement is visible through the caseback and benefits from a personalised rotor, with specific engravings. Considering the price level of the watch (over CHF 1.5K), we would have loved a bit more… maybe a higher grade from ETA, with more decoration on the movement. Yet, this won’t affect the overall precision and reliability of this engine. 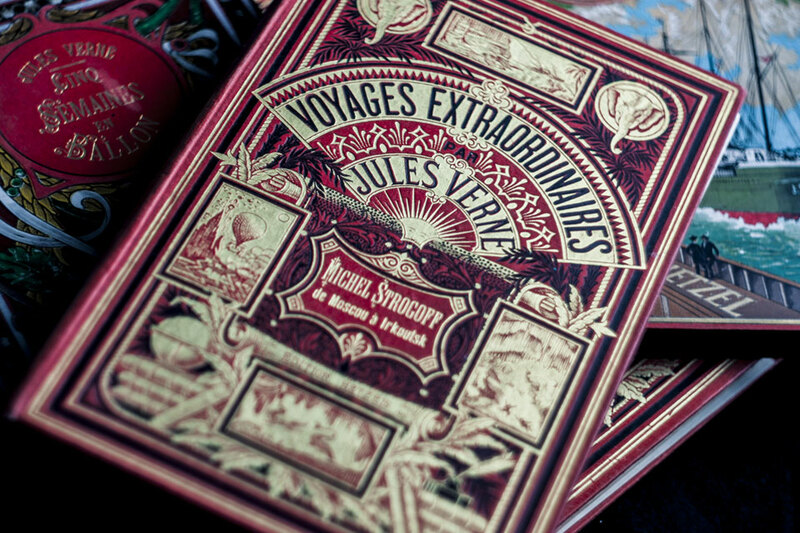 Not only are each version of the LAVENTURE Marine watches been limited to 50 per colour, the watch will be delivered to you in a case that has been inspired by the books of Jules Verne: Les Voyages Extraordinaires. This box certainly isn’t one you will throw away but instead keep on display in your living areas. The box will contain your LAVENTURE Marine watch, the extra bracelet, a tool to change the bracelets over as well as a manual. So, what can you do to help? This project will only be funded if it reaches its goal by Friday, July 7th 2017 – which is already the case, as at the time of publishing, the CHF 58,000 goal was largely reached, with over CHF 130,000 collected. You can pledge without receiving a reward or, depending on the amount you pledge, you can receive an excellent reward for your contribution. 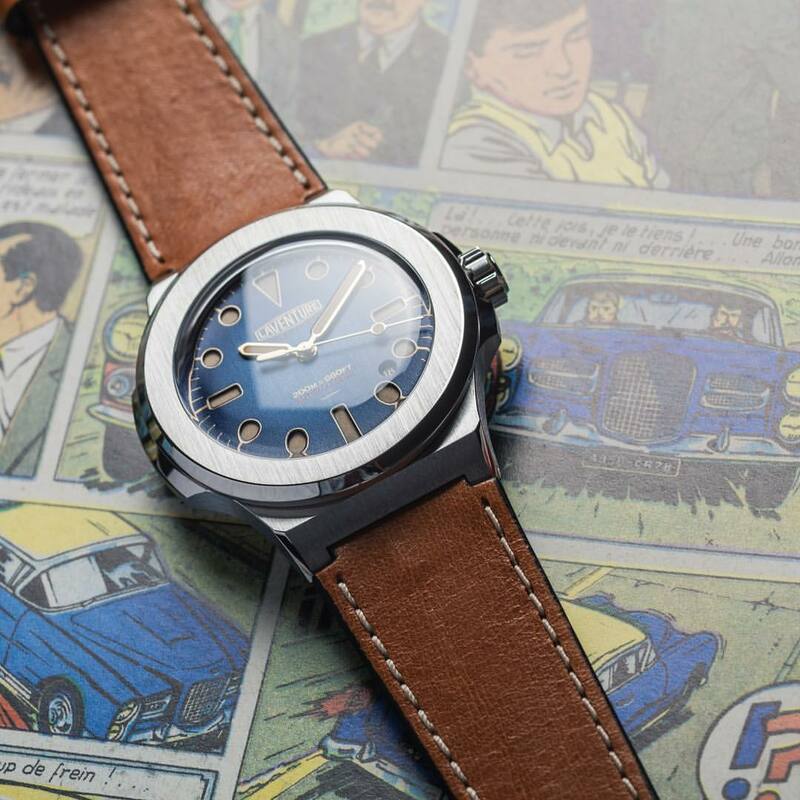 The rewards range from a Fine Art Print, one of the 50 LAVENTURE Marine watches that are being made to even a Collector’s Pack that contains three of the LAVENTURE Marine watches as well as a Fine Art Print. Prices starts at CHF 1,570 (early birds), then CHF 1,670. More details on the dedicated Kickstarter page. Very derivative design. The Nautilus, Big Bang, Royal Oak and Luminor immediately come to mind. Nicely finished – derivative indeed (I see Rolex too) and attractive. Movement is a good one, no doubt about that, and perhaps one does not always need the Geneva Stripes – especially for a tool watch. Rolex make a plain looking movement too (notwithstanding that their case backs are solid). Good bang for your buck! 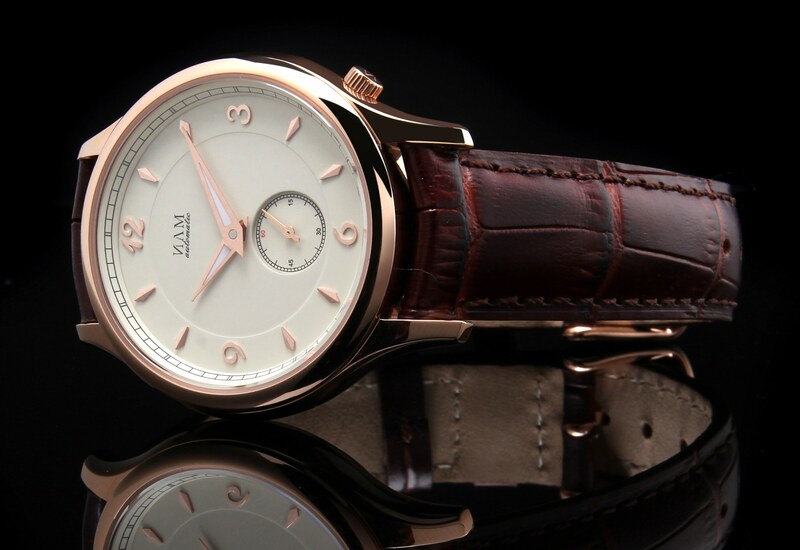 That is one nice looking watch. Case-back looks nicely done too. Rolex dial inside the PP Nautilus case. I kinda even like it, but don’t think it’s worth 1.7k they are asking. The movement finish is poor, could easily be TOP grade for the price. That watch is begging for a ’70s-style integrated h-link bracelet, like the North Flag. It’s pretty, but I think a bit overpriced.